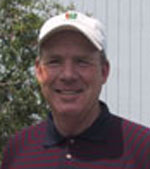 Peter Donahue is a founding partner of GreenToTee Golf Academy and its most senior instructor. A brief conversation with Peter reflects why he's won numerous awards and accolades as one of Chicago's top golf coaches. "Anything can be learned" is the cornerstone of his coaching philosophy. "Skill development and behavior modification go hand-in-hand. Learning how to practice well, and learning to enjoy your practice is a fundamental aspect of enjoying the game of golf." Peter incorporates the concepts of taking "dead aim" on your target, and building a rhythm and consistency into every coaching session. "Know your purpose, and practice with that aim in mind" is a familiar mantra to Peter's students. These philosophies serve his clients well in a Golf To Business team-building setting as well. In business, as in golf, target, strategy and a creative approach to the shot at hand are the keys to success, and to having fun along the way.